Beulah Baptist Church originated in the late 1800′s. The exact date is really unknown but, the most recorded date as a church orginization is 1895. The Lord provided a very unusual setting for the orginination of Beulah Baptist Church. The church originated under a big oak tree. The original oak tree stood on the property of Mr. Walter Hudson. Permission was given by Mr. Hudson for use of the tree which stood near the pond of Mr. John W. Mclamb. Beulah Baptist Church was founded at this spot which was the previous location. The first pastor of Beulah Baptist Church was the Rev. Reddin Honycutt. He gave his time and money and served the church for a period of approximately 30-35 years. Mr. Honeycutt and his family lived in Salemburg, which was about 23 miles away. Their only mode of transportation was by horse and buggy. The pastor and his family would come up on Saturday morning and spend Saturday night with a church member. Services were held each 4th Saturday evening and Sunday morning with dinner each Sunday after the worship service. The chuch at this time was in the South River Association. Preaching lasted under the old oak tree for a period of approximately 3-5 years with approximately 30-35 people accepting the Lord at this location. The original building of Beulah Baptist Church was built free by John W. and Handy Mclamb at the previous location. The Rev. Honeycutt, pastor at the time, helped with the building of the church. He never charged for any of his services. During this time the church grew to a relatively large number. In December of 1923 the church transferred from the South River Association to the Johnston Baptist Association with which it remains today. In 1923-1924 the church building was used as a public school for the Johnston County School System. The teacher at this school was Wiley Eldridge. From the mid 1920′s until around 1936 the church prospered and things went fairly well. It was around 1937 the church sank to a low ebb. It had no pastor and the church was in bad need of repairs as the roof had many leaks and much of the wood was in need of a new coat of paint. It looked as if those faithful and sincere people who had been interested in this God-given spot had wasted their time and effort. It was at this time that two of the members vowed to renovate the original building and strive to keep the church active. These to members worked diligently both day and night begging for donations and doing much of the renovations themselves. This project was completed by the cooperation of a few of the members and many friends in the community. During the 1940′s, after this renovation the church gained new members and continued to have regular services and carry on the various activities of the church. In 1948 the church voted to purchase its very first communion set. Also, in 1948 the church voted to have its first ever Harvest Day fundraiser. In the early 1950′s it was becoming apparent once again that repairs and renovations or new building projects were going to be needed in order to meet the needs of the church. In anticipation of this, various types of fundraisers were held, one of which was picking cotton with all labor going to the building fund. Also the Harvest Day events had proved to be a success and in 1950 the church voted to make this an annual event which we still continue today. And today, the same as when it was started, all proceeds from the Harvest Day Fundraiser go to the Building fund. On Sunday, November 11, 1952 another big decision was made in the history of Beulah Baptist Church. It was on this day a conference was held to determine whether the church should remain at their current location or move to some other location. The vote was taken by secret ballot with a vote of 27 to 10 to build on to the original building and remain at thier current location. Immediately following, for a period of approximately 2 years from 1952-1954, the church was in a building program with the additionof the wings on each side which would serve as Sunday School rooms. Also, the original pews were worn and badly needed replacing. The members decided to hand build new pews at the church with the oak timber being provided by a church member. The work on these pews was very slow as each pew was hand made using corregators and screws and each pew was finished by hand. The men of the church worked for many months to complete this project. With the 1960′s renovations was again in need. In 1962 the church was given additioinal space and a new look inside by the addition of the upstairs classrooms and the baptistry. Outside a new look was given to the old bulding by the addition of the steeple. In 1965 the fellowship hall was added for church dinners and other church functions for use by its memmbers. In the late 1960s the parking area was paved. In the 1970s stained glass windows were installed. Renovation again continued inside with the addition of wall-to-wall carpet, new cushioned pews, and new pulpit furniture was purchased. Also around this period of time walkways were poured to the fellowship hall. It was also during the 1970s the fellowship hall was enlarged with the addition of the back portion, creating a large facility for the church social functions. The church was active for the next few years and a period of time passed when the church had not type of renovation and basically no building maintenance of any type. Beginning in the early 1980s the church had many new members and many new programs were started. The church had organized new activities for its youth and attendance at both Sunday School and worship service was good. In 1982 the church adopted its first budget. In the mid to late 1980s renovation and updating of both the fellowship hall and the church building began. In July 1986 new stoves were purchased for the fellowship hall and storm windows were installed in all the Sunday School rooms as well as over all the stained glass windows, after each stained glass window had been repaired. Also at this time all the Sunday school rooms were repainted and a gas cooker and gas stove was purchased for the fellowship hall. Many renovations continued in 1987 at which time the interior of the church was repainted and the ceiling and the roof trusses were repaired. All the projects were completed by the men of the church with the only cost being that of the supplies. 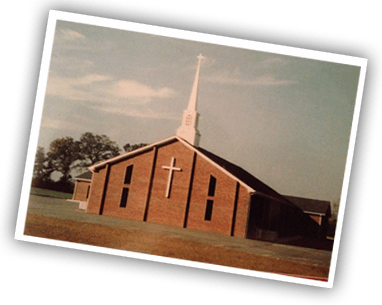 Later in November 1987 the church voted to place vinyl siding on the exterior and replace the roof shingles on the church. Improvements and renovations continued into 1989 with the addition of a new public address system. The roof on the fellowship hall was redone with new shingles in April 1989. In February 1990 the church revised the original constitution which had been adopted in 1968 originally. During the early 1990s the Lord continued to bless and the church was able to install a new heating and air-conditioning system. In addition a public address system equipment control room was added in June 1992, with all the work again being done by the men of the church. On August 14, 1993 at 4:00 am the educational area, baptistry and choir area was destroyed by fire with much heat and water damage to the sanctuary. After the fire, Sunday School and worship services were held in the fellowship hall. The church did not allow this to be a hindrance to them as far as their activities and functions. In October 1993 a new heating and air-conditioning system was installed in the fellowship hall. After the fire many outstanding events occured. On April 10, 1994 the church voted to purchase 11 acres of land located on Hwy 242 from Clesper Beasley for $60,000.00 to relocate Beulah Baptist Church. On June 22, 1994 the BIBLE CLUB Pledge Program was started to assist in funding the new building. On September 11, 1994 the first service was held on the new property which was an outdoor Vacation Bible School. There were 80 people in attendance at the service. On January 22, 1995 the church voted to build a new building on the new site and in April 1995 the Planning Committee recommended the church use Jackson Builders, Inc. of Goldsboro as the contractor. Also in April 1995 the church voted to become incorporated. In July 1995 the church voted to use the red and white theme for the interior of the sanctury obtaining white pews with oak trim and the carpet and upholstery would be red rose. This is the first 100 years of history. To be continued…….